I started learning Korean with the help of free resources available online. I learned how to read and write from Youtube videos and eventually learned grammar from TTMIK and grammar sites created by universities such as Click Korean by Seoul National University and Sogang University’s online Korean program. I wanted to learn more so after a few months, I started buying Korean textbooks and since then I’ve always been on the look out for good yet affordable textbooks. I had never heard of Korean Grammar in Use before and I wasn’t really planning on buying any grammar book. I was just randomly browsing at Hangulpark’s website and found Korean Grammar in Use by accident. After seeing the table of contents and some sample scans, I told myself that I have got to get my hands on these books. I searched online for reviews but there were only a few for the beginning book and none for the intermediate book but I still decided to follow my instinct and I took the risk and bought the book even though I didn’t know whether or not they were worth my money. Now that I have them and I’ve read through some of the chapters, I’m so glad I bought these books. They are really awesome! I should’ve started with these books. I would have saved myself a lot of money if I had known that these books existed. Note: Each of us has different preferences when it comes to textbooks so if you buy these books and end up not liking them, please don’t blame me. XDDDDD LMAO! – The pages are not that dull to look at. It has small and really cute illustrations which are not that distracting. The colors are easy on the eyes. I prefer the colors used in the Intermediate book. – The books have ample amount of sample sentences which you can actually use in real life. The sample sentences provided do not only focus on campus life. – The grammar points are discussed in a clear and concise manner. – Each book comes with an audio cd of all the sample sentences provided in the chapters. – The books compare the differences between similar grammar points, when to use them and when not to use them. It also discusses restrictions and things to keep in mind when using the grammar point. – The books have tables to further demonstrate the correct usage of the grammar point being discussed in the chapter. One row shows the base form of the verb which ends with a consonant and the other row shows the conjugated form. The same goes for verbs that ends in vowels. Action verbs and descriptive verbs (adjectives) are separated to avoid confusion. – Unlike other textbooks where the drills are supposed to be done with a partner or with the class and with no answer key provided, the exercises on these books can be done on your own and the answer key can be found in the last few pages of the books. These books are ideal for self-learners. 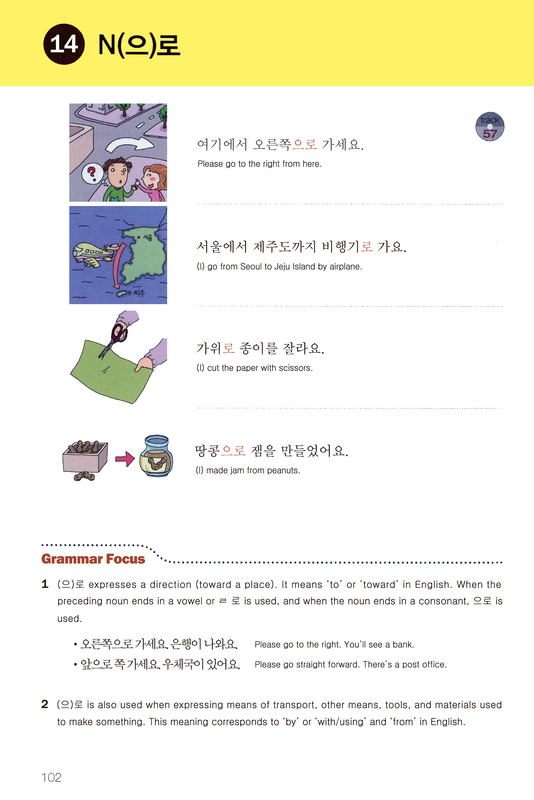 – As for the intermediate book, grammar points are explained in English and Korean. At the end of each unit, a short TOPIK-like quiz is provided to further test the learner’s skills. – Prior to buying these books, the learner must already know how to read and write Korean. Unlike other books which start with a brief introduction of Hangeul and teach the learner how to read and write Korean, Korean Grammar in Use doesn’t. – You must always have a dictionary with you because there is no word reference or glossary section. – No snippets or short articles about Korea or its culture which is quite a let down for me because I enjoy reading those articles in other textbooks. Same structure with more sections added. 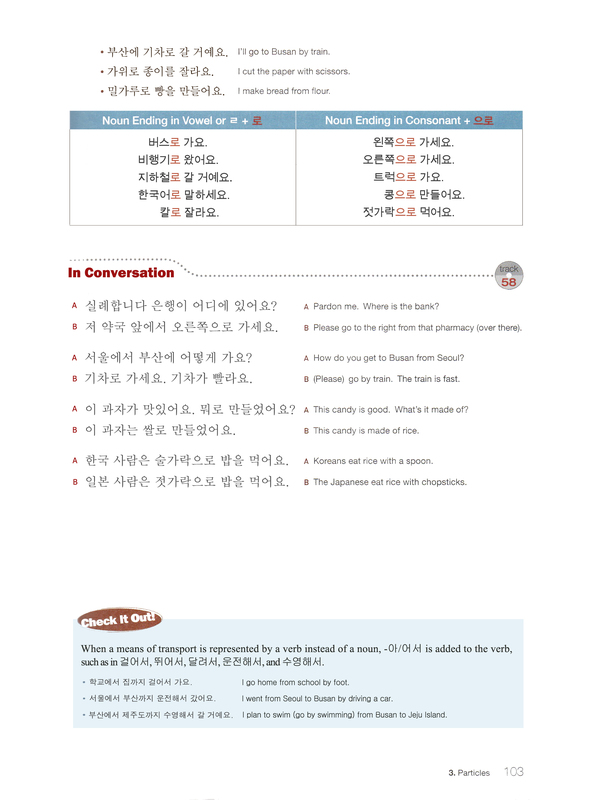 “This activity allows learners to practice the target grammar by creating a dialogue which illustrates the way the grammar point is actually used in Korean conversation. I enhanced the scans for better viewing. Click the thumbnails to enlarge. I’ve been searching high and low for books that fit my preference and I’m very much satisfied with Korean Grammar in Use in spite of a few minor shortcomings. Everything is well-organized and let’s not forget, these books are incredibly cheap (shipping fee is gonna cost you though). It’s my go-to book when I encounter unfamiliar grammar patterns. I hope they publish an advanced book soon. I’m looking forward to it. I definitely recommend Korean Grammar in Use to my fellow Korean learners. For any questions, feel free to drop a comment. P.S. Excuse any grammatical errors. Too tired to edit. Too lazy to rephrase/rewrite. This entry was posted in Textbook Reviews and tagged korean grammar in use, korean grammar in use review, self study korean, textbook review. Bookmark the permalink. Fantastic review! Many thanks for taking the time writing it! This book is exactly what I was looking for. I haven´t started studying korean properly yet, just learned hangul and bits and pieces from TTMIK and I think this is going to be one of the first books I purchase, together with the Yonsei level 1 series. I have the Yonsei Level 1 too. It’s better if you use that book only as a supplement. Do you like Yonsei books? I want to self study from them and I heard they are one of the best learning materials out there. Hmmmm…I only have Yonsei Korean 1 and I wouldn’t recommend self-studying using that book alone. It’s best to use it together with TTMIK lessons or any other Korean textbook like Integrated Korean or Korean Grammar in Use. Get a copy. You won’t regret it~! ^^ I’ve been using it more often than the other textbooks I have. I would like to start learning Korean language. Can you like recommend some useful books for me? Thanks!! This has helped me! Thanks I’m thinking of learning Korean on my own while I can’t get into the highly demanded class at school so I didn’t know where else to start til now! Hangul Park won’t let me shop there. The registration process asks for 주민등록번호. I suppose only people who live in Korea have that? How did you manage to buy from them? Is this purely grammar or do you pick up vocabulary on the way. You know, a beginners textbook. Hello! Well, the books focus on teaching grammar. There are no short passages written in Korean but you’ll be able to pick up new words from the sample sentences provided and there are quite a lot of sample sentences per chapter. Hi Angeli! I have been learning Korean for more than 3 years but I am stuck in beginner’s level itself because I wasn’t being consistent enough and a good student. I already have Yonsei 1-1, 1-2 (a kind Korean friend sent us these books 3 yrs ago as gift to us, me and my other Indian friend, we didn’t knew it then how invaluable these books actually are), Darakwon’s Complete Guide to the TOPIK beginner’s, “Korean Made Easy for starters”, “Korean Made Easy for beginners” also. Good luck with your Korean! Sorry about such a long comment. Thanks. Hi! Thanks for the comment. I really appreciate it. I have the Yonsei book too. I finished it but I feel like the book was too expensive and I didn’t even learn much from it. I hope you can find Korean Grammar in Use when you go to HK. It’s a really good book. Also, you might want to check out Ewha Korean textbooks as well. I don’t have it yet (it’s on its way here though) but judging from the scans I saw on hangulpark.com, I was convinced that Ewha textbooks are better than the Yonsei. I’m not saying that Yonsei is not good but I feel like I’m spending way too much money on it only to learn a few grammar points. I’m not sure about Yonsei 3-6. I have yet to check them out. I feel like we’ve met before. Were you in Charley Jang’s Skype class? It’s a pleasant surprise Angeli, yes I was in Charley Jang’s Skype class. He is the one who sent us Yonsei book. I checked my skype if I have you and seems I still have you but just that my bday wish did not reach you which was in Januyar 2012! Thanks for suggesting Ehwa textbooks, I’ll note them down. Charley sent us the real book by post, yes, so generous of him. We then scanned like 60 pages so that it could be used for our Skype class. He isn’t doing those classes now cuz we were bad students lol! Yes we are still in touch, especially on kakaotalk. He calls me sometimes on phone too! In fact we had a small skype conference just a week ago with charley and other former skype students, this was like after more than a year of gap. You use kakaotalk? I hope you enjoyed your birthday last year and this year too. WOW!!! Charley must be rich. Those books are really expensive! Haha! Yes, I use Kakao. Will you please say hi to Charley for me? hey again angeli~ sorry for the late reply! Yea Charley must be rich! lol! Add me on kakaotalk at “prashanthaku” I wouldn’t be able to reply next few weeks though, cuz my phone isn’t working. Yea I’ll say hi to him, actually u can meet him in kakaotalk too! (I’ll let him know when I can). by the way I during my recent Hong Kong trip I bought “Korean Grammar in Use” Beginning and Intermediate books because of your review and I love them! Almost everything what I need related to Korean language grammar seems to be in these books. I wanted to buy more books like Ehwa, but Ehwa was not available and also I didn’t had enough money to buy other books there. But, still I guess I have enough books to last at least one more year or more! hahaha! Of course charley would remember you! My phone wasn’t working more than a month until last week! Can you please add me again on kakaotalk? thanks! I plan to use this book as a supplement with the ehwa series. But i dont know if doing the previous TOPIK exams would be enough or not. Sorry for the late reply. I haven’t been online in a long time. Anyway, to answer your question, yes. Korean Grammar in Use books can be used as a supplement with the Ewha Series. I have the Level 2 books of Ewha Korean books. I use both of them to study. Doing the previous TOPIK exams alone isn’t enough. You need a good book that explains grammars well enough for you to understand how to use it. Can you give me book recommendation ? I alredy know how to read and write hangul. But I’m still lack at writing and sometimes confused how to make setences. Korean Grammar in Use Beginning and Integrated Korea, which one I should buy ? I’m not sure if I have replied to this comment before but I’d choose Korean Grammar in Use over Intergated Korean. To each his own. I can read hangul already but I’m a complete beginner when it comes to grammar and vocabs! Planning on getting the Korean Grammar in Use Beginning or Yonsei 1 (both textbook and workbook), but I’m so torn between the two T_T maybe you can help? Sorry for the late reply. I have both but I use Korean Grammar in Use way more often than Yonsei Korean 1 simply because it tackled more grammar points than the Yonsei Korean 1. When I bought the Yonsei Korean 1, I already knew some basic Korean so I was kinda disappointed that I didn’t learn anything new from it because I have already learned those grammar points online.